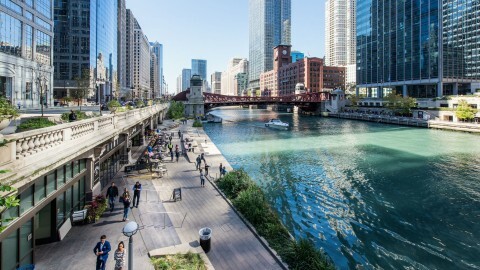 With the upcoming completion of the Chicago Riverwalk, the city’s long-held vision for our “second shoreline” is coming into focus. But high above the river banks, changes are happening just as dramatically. What’s at the River’s Confluence? 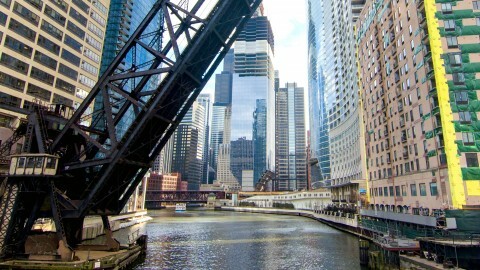 The Chicago River’s confluence is the point where the river’s three branches come together. 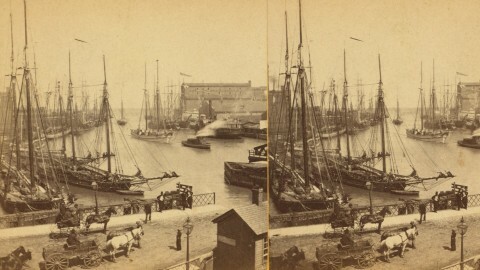 Beginning in 1848, this area was known as Wolf Point. It was also called “smoky hollow” due to sooty refuse coming from factories and railroads, as well as steam from nearby ships. 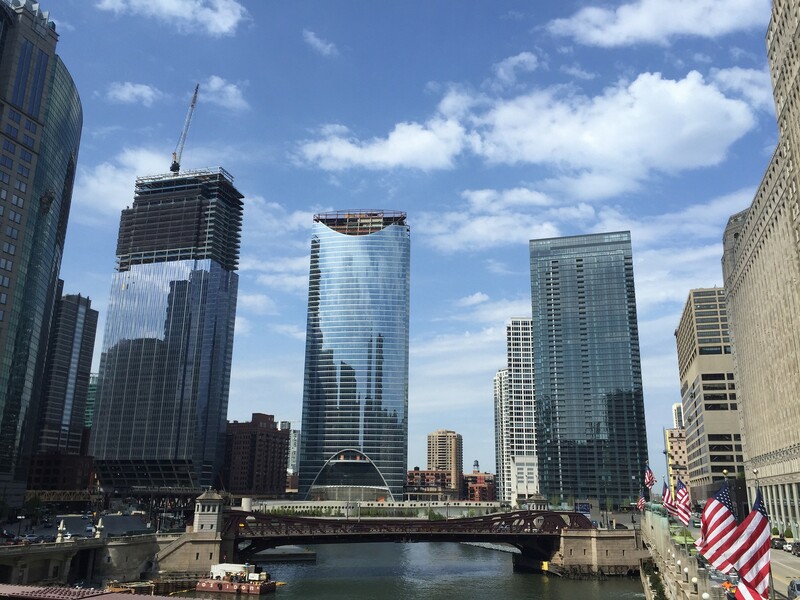 In the 21st century, “smoky hollow” is being transformed into a home for three new glassy towers: Wolf Point West on the north side of the river, River Point to the west of the river and 150 N. Riverside at the northernmost edge of the river’s south branch. 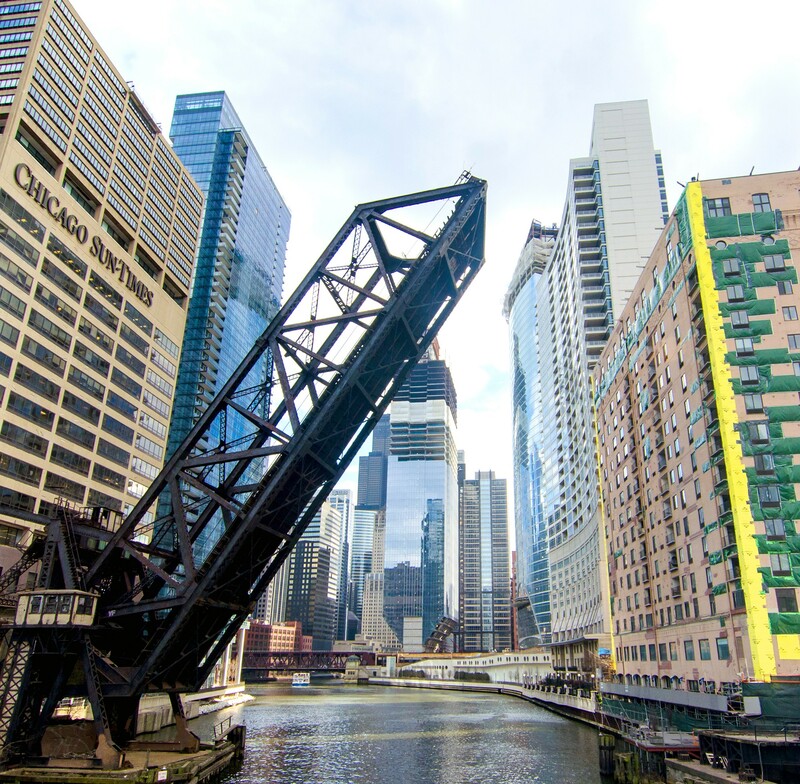 Here’s a look at three major new building projects shaping the skyline on the Chicago River. 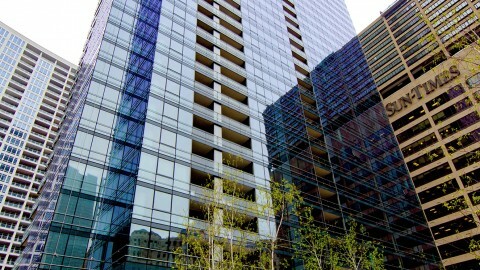 Wolf Point West, designed by bKL Architecture, is the first of three skyscrapers on this site. The 48-story residential tower has 510 rental units within 571,000 square feet. At a total height of 493 feet (150 meters), the building’s energy efficient glass walls extend beyond its occupied floors to conceal the mechanicals on the roof. 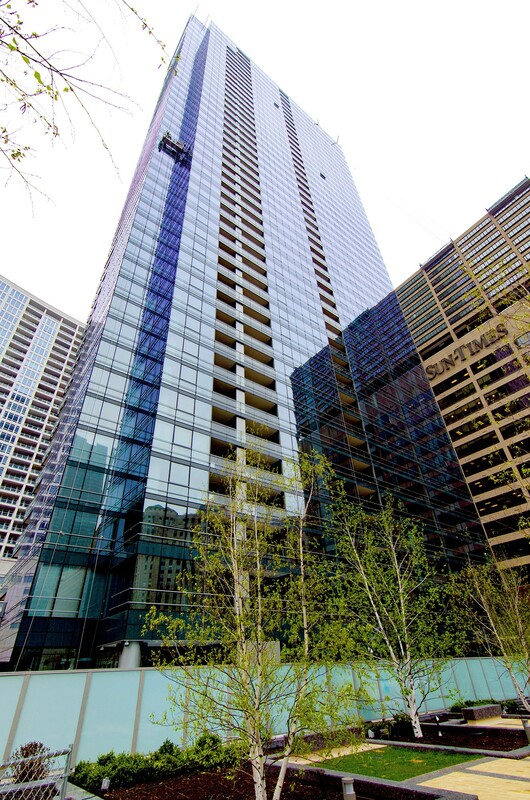 Wolf Point West’s balconies are inset, allowing the tower’s slender profile to remain uninterrupted. The building’s parking garage is located below street level. This allows landscaping to hide the garage and to link up to the river’s edge—extending the Riverwalk along the north bank of the river. Eventually, two more buildings will be added to Wolf Point as part of a mixed-use master plan designed by Pelli Clarke Pelli Architects. Construction on the second tower is scheduled to begin in early 2017. A third tower is also planned. While the exact height and completion date for that building are not yet known, the estimated height is between 900 and 1,000 feet (274 to 305 meters). Across the river to the west sits the arched facade of the 52-story River Point, a commercial project designed by Pickard Chilton. When completed, it will offer more than 1 million square feet of rentable office and retail space. River Point is set back from the river and from five riverfront railroad tracks, which have been separated from the river by a sea wall. Amtrak required the tunnel to be extra wide to allow for a future high-speed rail line into Union Station. Above the tracks, developers will work with the city to create a 1.5-acre public park. 150 N. Riverside, the third of the structures along the river, poses perhaps the most challenges. Designed by Goettsch Partners, the building wedges 1.2 million square feet of office and retail space into an extremely narrow site. Unlike most properties on the river, this parcel of land has remained essentially vacant since the 19th century. That’s because the site is limited on all four sides by railroad tracks, City of Chicago property, the river and a condominium building. The solution to this problem is visible in the shape of this 53-story tower. 150 N. Riverside is squeezed between the train tracks and the river. The building’s small footprint uses only 25 percent of the land on its site. The remaining 75 percent will be devoted to a public park, a riverside amphitheater and an extension of the Riverwalk (which will link with River Point’s public space). The building flares out from its narrow footprint to reach a width of 120 feet as it moves skyward. This ingenious design was complicated by the fact that the building sits on the river. In addition to soil problems, wind tunnel tests revealed that the building acted as a sail against the southwest summer winds, which tended to push it toward the river. To address this problem, engineers added 12 dampers containing 200,000 gallons of water to the top of the building. 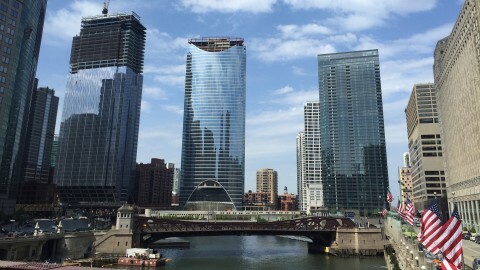 Each in different states of completion as of May, 2016, all three of these glass-skinned skyscrapers demonstrate that demand is high for riverfront space. 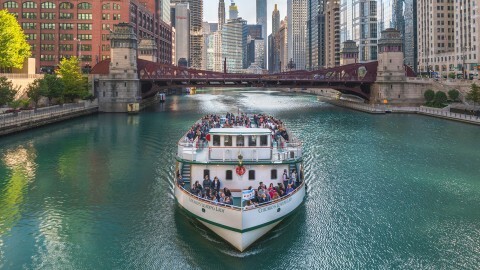 Stunning views, convenient public transit and access to parks make living or working on the river a great Chicago experience. CAC will continue to follow the rise of these new buildings—and others—along the Chicago River.